El Nino Del Firo, the winning team of the "Senior"category of Nike Cup Singapore 2010, headed to Brazil recently to fulfill that once-in-a-lifetime dream to train in the famed Granja Comary. One thing that for sure is that the group of five boys that formed the El Nino Del Firo will have the admiration from all their peers for being the selected few from around the globe that travelled to the famed Granja Comary – the Cradle of Football in Brazil that is also the training base of the A Seleção – the Brazilian national team. That was the reward for emerged as the champions of the “Senior” category of the Nike Cup Singapore 2010. (Pictured above) Learn dribbling the Brazilian way!! Upon arriving at Granja Comary, the boys - Syafiq, Izwann, Faiz Rahim, Sahhid and Afiq were all giving once-in-a-lifetime experience to train exactly how the Brazilian national team train . Part of the training trip was given the opportunity to be coached by some of the finest coaches in the academy that the boys learned the finer details of the game such as going through tactical drills in awareness, passing and positioning while in Teresópolis, where the academy is located. (Pictured above) "Listen up, boys" as the coach gives out his instructions to the team. 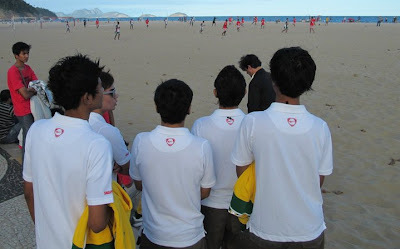 But it was not all about having undergo drilling sessions on the pitch, the Singaporean boys were also given the opportunity to stroll along the famed Copacabana beach to catch beach football actions there. The third day of the trip saw El Nino Del Firo being put to the test when they found themselves pitted against the other winning teams of the Nike Cup from Malaysia, Indonesia and Thailand that joined them in this training trip. 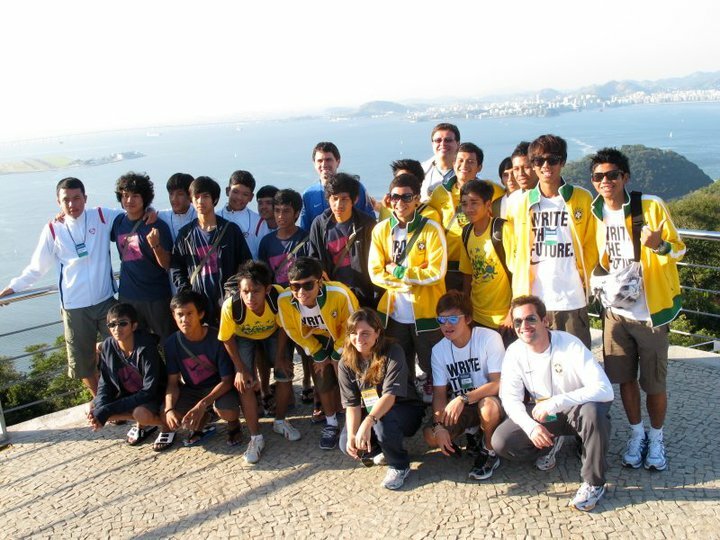 (Pictured above) It's not all about "work" and sight-seeing too with the other participating teams at Sugar Loaf Mountain. Beside playing against their “neighbours”, the Singapore representatives also gauged themselves against two top Brazilian youth teams were on the same day. Beach football plays an important role in the development of any Brazilian footballer besides futsal, the 5-a-side indoor version of the game. (Pictured above)The Brazilian coach and player showing the boys how beach football is properly played! The fourth day of the trip given the boys an opportunity to be gauged by one top Brazilian beach football coach on their skill level that trademarked the game such as one-touch passing, juggling and volley of the ball while playing on the sandy surfaces. It is back to the business on the fifth day of the trip, as reality unfolded on the futsal court. (Pictured above) The Heat is on!! Having proven themselves at their own backyard, El Nino Del Firo squared off again against their counterparts to decide who are the best in South East Asia. Although our Singapore boys did make it to the final of the challenge, they failed to overcome the eventual winners, Enjoy FC from Malaysia at the final hurdle. It was double happiness for the boys from across the Causeway, as they were also the winning team of the beach football competition.